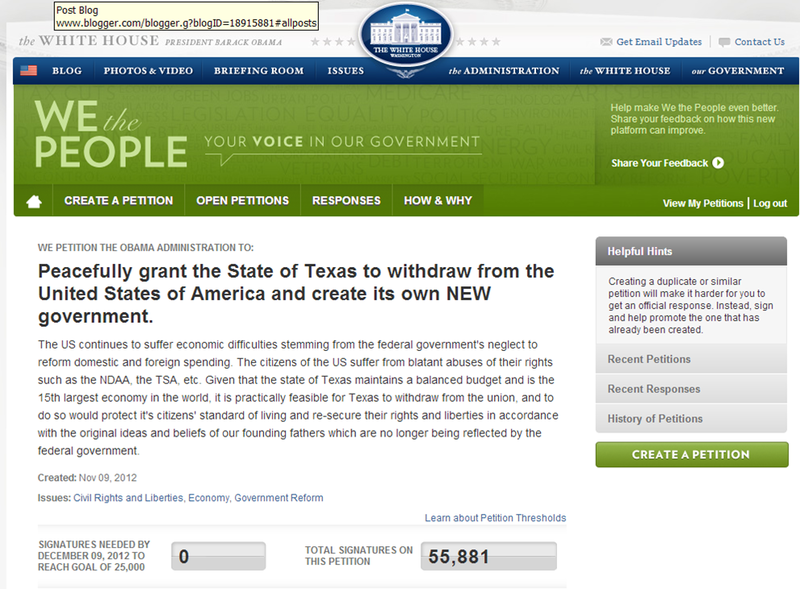 Can this secession petition really succeed and would it really be peaceable? I don't know. But Quebec had a cessation referendum in 1980 and 1995, the latter one failed by only 49.4% - 50.6%. Talks are still underway to allow a peaceful divorce. It is a distinct possibility. In 2010 Texas had a candidate for governor (Larry Kilgore) who ran on an open secession platform. He also ran on secession platforms in statewide races in 2006 and 2008, garnering 225,000 votes in the latter race. Another 2010 gubernatorial candidate was on record as willing to allow a referendum vote. In my opinion, it all depends on how many people support it. Texas is a big enough state that if enough people were to enthusiastically support it, it would be a peaceable withdrawal. By putting this type of petition on the table, we invoke the feminist conundrum. Feminism wants to empower women to make their own choices about their lives, expecting, of course, that women will chose careers, no children, and maybe marriage - or not. They are flummoxed and angered when the very women that have been empowered by the feminist machine to make those choices, use that "freedom" to chose to be mothers working at home for the good of their families. The political establishment has long preached democracy, self-determination and self-government for nations around the world. This type of petition puts them in the same position as the feminists - if they deny it, they contradict themselves and expose their agenda, putting themselves in the the position of a repressive regime. If they grant it, we win our freedom back. Some have wondered, should we sign this petition? Won't that put a signer on "the list"? Yes, it might. So what? This is real, it is here, it is here now. Now is the time to stand up and be counted. Who knows what the Lord will be pleased to do. Our God is a mighty God. For the glory of his name he parted the Red Sea to save fewer people than than live in Houston. He would have saved Sodom for 10 righteous people. We have already witnessed the Lord work in astounding ways in our little county in the last 6 months. Are you praying for righteousness and truth to be restored in your county? The effectual fervent prayer of the righteous avails much. If so, keep praying and working. Ora et Labora. Luther had no idea his simple act of nailing 95 technical propositions to a door for a scholarly debate would result in the Protestant Reformation. God alone knows what good will come of this petition, all we can do is obey in faith. But I do know we don't have because we do not ask. This story has now been picked up by ABC and many others. 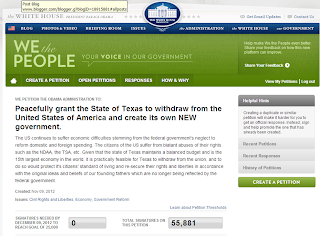 As I write, the Texas petition has over 55,000 signatures and is gaining 5,000 votes an hour. At that rate, it would add 100,000 a day and could easily top 2 million votes by the time the petition signing window closes on Dec 9. Although this petition is mainly symbolic and, from a legal perspective, largely meaningless, its political message to Austin (not Washington) is anything but insignificant. All governments follow the crowd. The bigger the crowd, the faster they follow. A couple million people signing a petition like this provides a footing for people to ask their state representative, "Why don't you introduce a bill to bring this referendum to a vote?" and it creates a favorable political atmosphere for such a bill. More signatures create more forward momentum that gets harder to stop as the numbers get bigger. In 1994, I saw a grass roots effort by home schooling parents shut down the US Congress over a proposed amendment to HR 6. Less than 2% of US children were home schooled at the time, yet Senators and Congressmen were tripping over themselves to get something nice into the Congressional record about it. In the days before the internet, calls on that amendment crashed the congressional switchboard generating more calls than GATT, NAFTA, and Homosexuals in the military combined. The proposed amendment failed 430+ to 1 when a few days earlier it was slated to pass by an overwhelming majority. In addition to its political value, the petition also has practical value in that the president is the Commander-in-Chief of the US armed forces. It would be nice to know if he would allow a peaceful departure or if he would use military force against people seeking to peacefully withdraw? Whether one believes his answer is, of course, an entirely different question. Some have characterized signing this petition seeking peaceful secession for just cause as "reckless," proposing that we focus instead on Representative David Simpson's legislative efforts to enforce the 10th amendment. But why do these two courses of action have to be mutually exclusive? Supporting these efforts should not preclude peaceful calls for secession. In fact I would argue that the best help we can give to Rep Simpson's efforts to enforce the 10th Amendment is to get a million signatures on this secession petition. That tells Austin we are serious, that we fear God more than we fear them or Washington, that we are willing to risk our security for our liberty, and that we expect them to actually enact legislation with teeth. The fact that many are not signing the petition, fearing ridicule or even retaliation by the same parties perpetrating the abuse that gave rise to the petition, indicates how close we have come to being an enslaved nation. Every nation will always have some who are paralyzed by these fears. But the presence of this fear in a majority is what distinguishes a free people from an enslaved people. When people fear God more than they fear men, and are willing to say, like Patrick Henry, I know not what course others may take, but as for me give me liberty or give me death, they will be free.Those who value safety and security above liberty get neither. We need Godly men encouraging the weak and fearful to be courageous, to fear God rather than men, and to be willing to stand up and be counted with the 100,000 others already on record as standing against tyranny.